Large Animal Anesthesia Machine: LAPD-1000 - JD Medical Dist. Co., Inc. The LAPD-1000 is the ultimate blend of simplicity, ergonomics, and efficiency. The LAPD-1000 is a passive anesthesia machine that is designed for use in large animal veterinary medicine. The machine was designed to be as simple as possible so that it is easy to use but it was also designed to allow the operator to expand the capabilities of their practice and use it together with a ventilator. 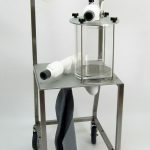 It uses some of the same components as the other anesthesia machines and ventilators in JD Medical’s large animal product line so that in case something breaks, there are interchangable parts available. 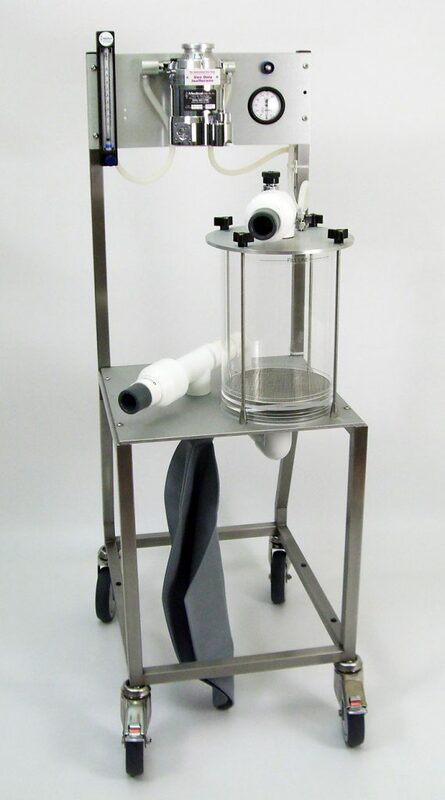 The LAPD-1000 is built on the same platform as the other JD Medical large animal anesthesia products: our heavy-duty balanced stainless-steel frame. Compared to other large animal passive devices, the design of the LAPD-1000 ensures that the weight of a fully-loaded absorber canister and vaporizer is evenly distributed and not top-heavy. The LAPD-1000 rolls on 4 large hospital-grade casters which allow the machine to move smoothly and easily and the large 4″ wheels make the machine robust enough to travel over some of the obstacles often found in large animal operating rooms. All of the parts and connections are easily accessable and clearly indicated so that the operator can clearly and quickly see the necessary adjustments. Backed by JD Medical and our unmatched service and support, the LAPD-1000 is a passive machine that provides accurate and efficient anesthesia delivery and incredible expansion capabilities. Another important feature of the LAPD-1000 is that like all of the anesthesia equipment manufactured by JD Medical, it requires absolutely no electricity or outside energy to operate. We believe that in our rapidly expanding society, it is of exponentially increasing importance to be aware of our energy consumption and to everything we can to minimize the energy we use, especially the energy we waste. Even when the LAPD-1000 is used in conjunction with our standalone LAV-3000 Large Animal Ventilator, there is no electricity or outside energy required for operation. Typically, ventilators require considerable amounts of electricity to operate. JD Medical is the only company on the market using a pneumatic drive system that eliminates the need for electricity; our equipment needs only a 50PSI gas source to operate. This is also very important and very handy for use in places such as barns or even outside where electricity is simply not available.